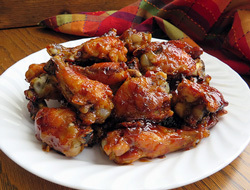 Great chicken wings to serve as an appetizer at any party. Whether you are having a birthday party, football party, or just a gathering of friends, these barbecued wings are sure to be a hit. Place the wings on the foil lined baking sheets and cook for 1 hour in preheated oven, turning once. Mix sauce while the wings are cooking. 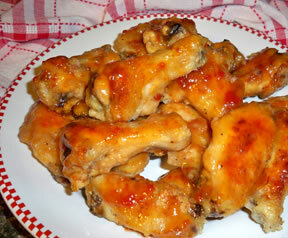 After the wings have cooked for an hour, remove from the oven and brush them with the sauce and cook again for 10 minutes. Remove from the oven and turn. Brush again with the sauce and cook for another 10 minutes. They are then ready to serve or keep warm in a slow cooker until you are ready to serve. Note: After cooking the wings in the oven, they can be finished on the grill. Brush with barbecue sauce and grill on medium for 7 minutes; then turn, brush with sauce and grill 7 more minutes. 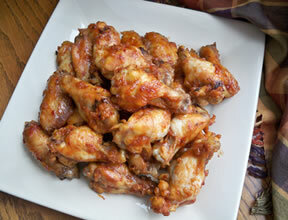 "I had some friends over for the Super Bowl on Sunday and made these wings for them. They were pretty easy, even for me. Everyone thought they were great. Just like the saying, "Finger Lickin Good"!"